Drawn to the West: An “impossible” insect observation? There aren’t supposed to be any fireflies in Montana. At least not the type that blink and flash in a mesmerizing stereotypical way. But, I’m getting ahead of myself, because when I saw fireflies flashing this summer, I didn’t know any of the science behind what I just told you. Just days before the 4th of July, family friends invited my mother and me to come to their place at dusk. No explanation, just a promise of a remarkable natural spectacle. As the sun waned, we walked from their house out into the brushy riparian area behind their garden. At first slowly, and then with increasing intensity and frequency, pinpoints of light built into a twinkling crescendo. My mother was as stunned as I. She was born in the same small town, has lived there most of her life, and has only heard of such a local light show. While I scurried about trying to catch a few of the insects in a clear mason jar, she and our hosts chortled about how the best fireworks show that holiday weekend was happening right there along Spring Creek. The denouement of the tale is that there are no scientifically published recorded observations of flashing fireflies in Montana, or really anywhere west of Kansas. I didn’t realize this until a few days after I passed the jar to my young nephews who delightedly released the streaks of light into the night. 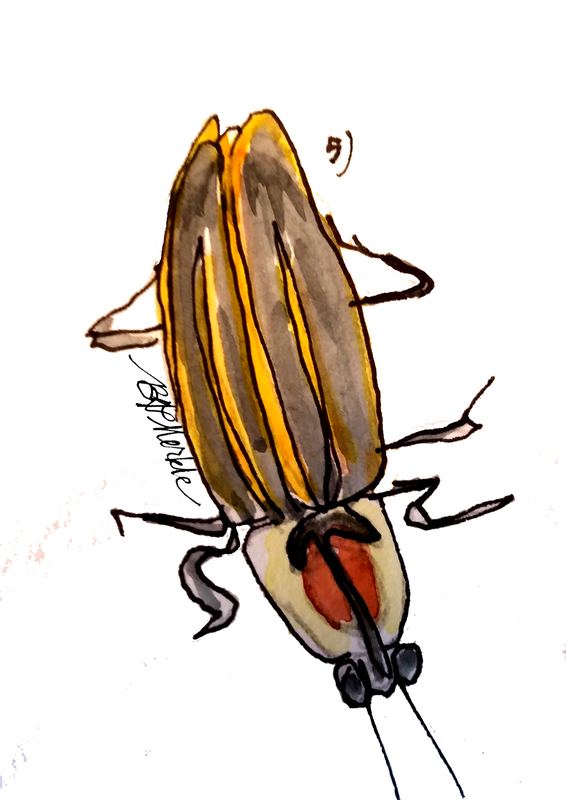 The two insects I caught, observed, and sketched would have been gladly welcomed into the nascent firefly collection being assembled by Dr. Michael Ivie of the Montana Entomology Collection (MSU). By the time I visited him, the week after the 4th of July, the fireflies were done flashing, so collecting more wasn’t an option. 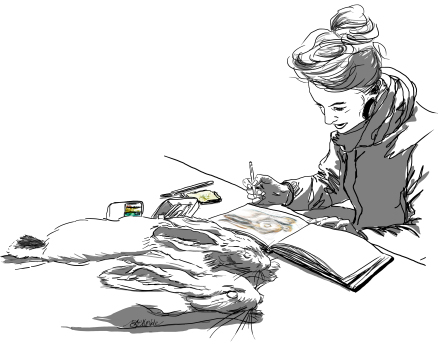 However, he was able to identify the species we saw based on my sketches. And he strongly encouraged anyone who observes lightningbugs in the West (which is evidently more likely than science publications suggest) to collect them and send them to him for identification. In anticipation of the syndicated column, I indulged my curiosity, and dug as deeply into scientific literature as Google Scholar and scads of citations would allow. The column explores highlights of what I found in that reading frenzy and some of what I learned during a visit with Dr. Ivie and a prowl through his global firefly collection. These highlights include why and how fireflies glow, where in the West they are known to occur, and how we can enhance habitat to support them. The following illustrations accompany the column, which is available to direct subscribers (new!) and publications running Drawn to the West as a syndicated column. These are the illustrations I sent Dr. Ivie to identify the species we saw. True fireflies are beetles of the family Lampyridae. James E. Lloyd, a Florida entomologist and the country’s preeminent “fireflyer,” reports there are at least 185 firefly species in North America and a minimum 1148 species globally. Of the three types of fireflies, only lightning bugs fly and pulse light. Dark fireflies emit pheromones rather than light, and glowworms simply glow. Astonishingly, fireflies produce no heat when they illuminate. A lightbulb producing the same intensity of light would generate approximately 80,000 times the heat. Depending on the species, firefly lights can be yellow, green or even pale red. Because they contain heart-stopping toxins, fireflies warn off would-be predators with their lights. Hence, fireflies have few predators, but humans are top of the list. Unfortunately for firefly populations, we find luciferin and luciferase useful. These compounds have been used to code genes, test for bacteria contamination in foods, and measure effectiveness of cancer drugs. If you’d like to read the column, subscribe directly (new!) or let your local newspaper or magazine editor know you want to see an illustrated version of the West in their publication! ← MT Outdoors published 2 of my water monitoring photographs!